The Napoleon F60 Hand-Held Thermostatic Remote Control with Digital Screen is really the class of the field when it comes to operating a Napoleon heating appliance. This remote is simple, affordable, and extremely useful to all types of homeowners. With this remote you get on/off thermostatic control, battery-operated, hand-held design, and an easy-to-read digital screen. The 2-degree temperature swing reduces that annoying short on/off cycling, and it can be set to check the room temperature every 60 seconds and react accordingly. Simplicity, function, and value make the F60 a great choice for your Napoleon appliance. Will this control the NPI4 pellet stove? This will indeed work for that insert. Does this come with the remote and the receiver? Yes. This product listing is for the remote receiver and transmitter pair. I have an Osborne fireplace with a wall mount millivolt thermostat. Will this unit work for me? If you are looking for a Millivolt thermostaic remote for a gas unit the Ambient RCST Standard Thermostat On/Off Remote Control would be the best suited remote. Will this product work with the PROCOM Heating model FBD400RT? No, that unit has a model specific remote and you will need to contact ProCom to purchase one. Will this work as replacement for Honeywell RT8220 1032 on a Vermont Castings natural gas stove? No you would need to use a RCST. Will this work on a Napoleon Timberwolf, tps35, pellet stove? This will indeed work for the tps35. Does this include the receiver for inside the fireplace? Yes. This includes both the transmitter and the receiver. Will this work with Napoleon Gas Heater ModelGVFS60-N? The remote in question will indeed work with the GVFS60. Can the Napoleon F60 hand-held thermostatic remote control with digital screen be used with the Bayfield Blower (both "connected" to a thermostat) so that you can use the thermostat with or without using the blower? No, this F60 remote only operates the burner in select Napoleon gas fireplaces and stoves--it does not offer control over the blower in any way. 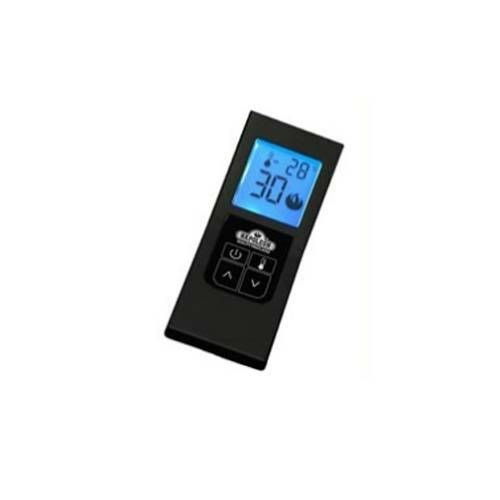 Is this Napoleon F60 hand-held thermostatic remote control with digital screen a universal unit? While this remote is only meant for use with Napoleon gas fireplaces and stoves, it may indeed be used on a gas hearth appliance with a millivolt valve system. Does this unit come with everything that I'll need to use it or is it just the remote? This will come with instructions, the remote and receiver. How do you set the remote to check the temperature every 60 seconds and adjust accordingly? By depressing the thermostat button on the upper right corner of the control pad on the remote, the remote will go into thermostatic mode. You can then use the up and down arrows to set the desired room temperature. The remote will then begin detecting room temperature every 60 seconds and modulate the appliance accordingly. Can you use the existing switch on the GDS50-1N and wire the F60 also? Just in case the remote does not work for some reason, you would have the switch on the back. You can indeed wire a secondary loop, using the switch as well as the remote. In that case, the unit will operate as long as either the remote circuit or switch circuit is closed. Yes, on my unit wired according to the included instructions the fire is controlled by the thermostat when the switch is in the off position and the fire is on when the switch is in the on position. Yes. The receiver for the remote control is wired in series with one of the switches on the side panel. Does this product come with the receiver as well? This product is indeed the transmitter and receiver package. Does this product come with the handheld remote and receiver unit? Do both work off of "AA" type batteries? This item does indeed include both the handheld transmitter and the receiver. The receiver utilizes four "AA" batteries, while the transmitter uses "AAA" size. Does the F60 remote come with the transmitter? Yes, the F60 remote comes with the transmitter and receiver. What's the warranty on this item? This remote kit has a 1 year warranty from date of purchase. Does thermostatic control also mean that the height of the flames can be adjusted? No, this hand-held remote features a thermostat that will only turn the burner of a compatible millivolt gas fireplace on or off based on a temperature that you select. What does the error code 2 on the F60 remote mean? Per Napoleon, "Code #2 means the thermostatic sensor within the handheld has failed. It could have failed from physical damage (shock, etc) or from a latent defect. The only way to restore functionality would be to obtain a new handheld for the system." Does this remote have a fireplace timer? While this remote does feature a thermostatic control function that will maintain a preset temperature, it does not have a built in timer. The remote control is easy to use and view. Great customer service on the phone and it works like a charm with my current fireplace! Very easy to install. Works as stated and is very reliable. Bought a used Napoleon Stove & remote connected on first try! I like it a lot because it has a very accurate temperature control. ConsSettings buttons are hard to see in dim light. Very simple installation for the controller. But the remote should have either raised keys or some sort of back lighting for the various switches. Was not happy with my Sky Tech remote. Purchased this unit to replace it and it is wonderful. Much better temperature control and very responsive to room temperature. No more large temperature swings more constant than before. Easy to connect, worked great right out of the box. ProsWorks exactly as advertised. We set it at 70, the burner lights at 69 and goes out when temp reaches 71, The blower continues to operate till the stove cools, as advertised. ConsI should have got this a long time ago. Two wire hook up so easy and works so very well. I really enjoy the Napoleon brand. The last Napoleon remote continued working for over 15 years. However, it was directly connected to the electric via the fireplace. If we lost power, the electric remote would not turn on the fireplace! This little remote is battery operated and operates independently of the electric. Therefore, if we lose power now...we still at least have heat to warm the house. The instructions are easy to understand and we can set it in a very simple manner. The number readout is adequately large for those that have trouble with vision. This remote was a good purchase. This store delivered our order to us via extremely quick shipping packaged very well. I appreciate their fast response to our order. Very easy to use and upgrade my fireplace from napoleon . This works good on my pellet stove and very easy to install. Who cares about the thermostat, it's warm now. I loved it when I got it, and will love it again. ProsInstalled like a dream arrived quickly. ConsI was weeks getting around to ordering it. It needs to be self-ordering. I love this remote. The temperature swing is much better with this one than my last.